Have you ever thought about making your own homemade cleaning products, but have always been intimidated like me? I have to admit, I have never made my own cleaning products before because I didn't know any 'recipes' or where to start. Thankfully, the makers and owners of Cleaning Essentials are here to make it really easy for everyone like me who can easily follow a recipe. 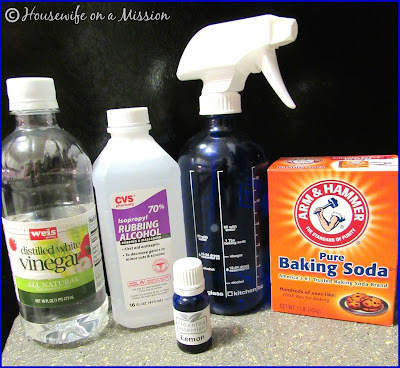 Head on over to Housewife on a Mission to read about her experience with Cleaning Essentials. Cleaning Essentials is the brainchild of Martha and Mike, urban homesteaders living in a small town in upstate New York. They have two beautiful children and a backyard full of chickens. Mike has been creating natural cleaning products for years. Martha wanted cleaners for their home that were effective and safe for the whole family, in line with their home-cooking and healthy lifestyle. Hence the birth of Cleaning Essentials, attractive cleaning bottles and supplies, with all the guidance you need to make your own cleaning products in moments with ingredients from your pantry (adapted from cleaning essentials.com). It's really that simple! There are more than several cleaning recipes printed on Cleaning Essentials' glass spray bottle that you can use. I love that all of the ingredients are in everyone's pantry, so anyone and everyone can make their own homemade cleaning products! What would you clean with Cleaning Essentials Glass Spray? I'd love to have this in my home! 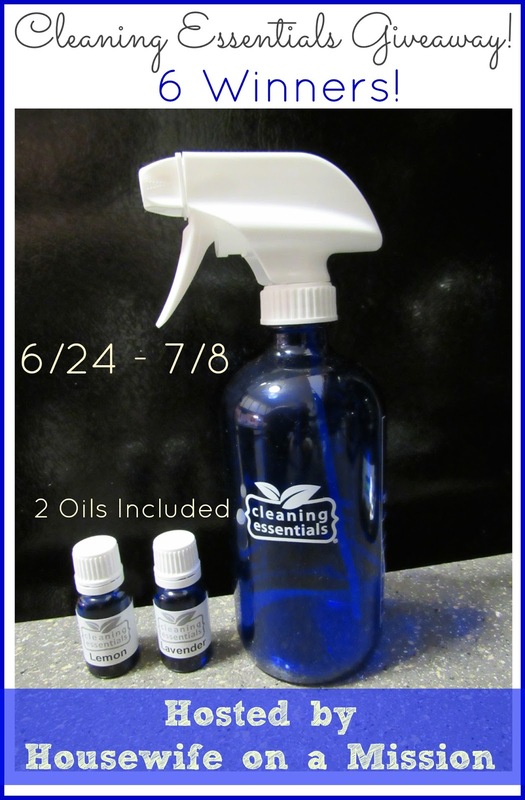 You can purchase a Cleaning Essentials glass spray bottle for $19.95 currently $17.95. 6 lucky winners will each win a Cleaning Essentials Glass Spray Bottle, with 2 essential oil samples included! *Disclosure: Housewife on a Mission and the blogs participating are not responsible for prize fulfillment or shipment to winners. Winners will be drawn at random then emailed and will have 48 hours to respond to claim their prize. If no response is given, another winner will be chosen. Facebook, Twitter, Pinterest, and any other social media are not affiliated with this giveaway. I would love to win because I enjoy using essential oils and natural products. I do make my own cleaning products often and I use essential oils in them.